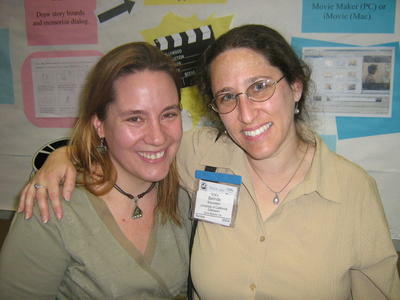 As I had been accepted as a speaker on “Student Films as a Memorable Linguistic Experience” at the 41st Annual TESOL Convention in Seattle, Washington, from March 20th-24th, 2007 I offered to represent TESOL France as Affiliate Delegate. conferencing with recruiting teams situated all over the USA. The first day I received the program book with more than 300 pages and weighing nearly 3 kilos! It is a very useful document as it contains summaries of all the events and the emails of all the speakers at the Convention. We were also given badges and turquoise blue bags. You could easily recognize attendees because of these badges and bags. And there were attendees everywhere… in the numerous hotels, coffee shops, restaurants and stores around the Convention Center and even at the youth hostel “The Green Tortoise” where I had been lucky enough to book a bed. TESOL is a huge undertaking especially as practically everyone is a volunteer. You feel that people are really giving of their time and energy to be part of an ideal they truly believe in. The people running such a convention are “leaders” who have the strength to bring people together and promote the profession of “Teachers of English” everywhere in the world. The out-going president was Jun Lui, the first non-native President TESOL has had in its 40 year history. In his plenary speech Liu told us of his countless struggles as an EFL learner during the late Cultural Revolution in a rural area near Shanghai, China. Later Lui became an EFL teacher himself in China before being able to pursue his Ph. D. in the USA. Liu went on to excel in his profession shared with us seven stories depicting various phases or experiences in his life. 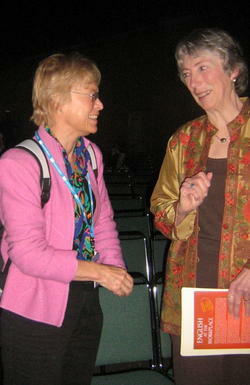 Betty Azar was another plenary speaker, who is known worldwide in the EFL profession as the “queen of grammar”. Azar has written the famous blue, red and white workbooks that have been used over the past 25 years by millions of English language learners and are published by Broché. She spoke of “Teaching Amid Change“ explaining her view on how teachers on the “frontline” so to speak decide on their own pedagogical practices and principles while being exposed to varying approaches and methods. Azar started writing her grammar-based textbooks in the hope of earning enough money to redecorate her living room! Today she is high on the list of best-selling authors. Mawi Asgedom came to the USA at the age of seven as a survivor from a Sudanese refugee camp. He overcame great obstacles and family tragedy to finally graduate from Harvard University and go on to devote his life to the mission of inspiring and “uplifting America’s teenagers”. Asgedom has published three books and four CDs that have been used by thousands of classrooms. Finally I wish to mention Ron Carter, Professor of Modern English Language at the University of Nottingham, who delivered a speech on “Language, Creativity and Classrooms”. I totally agreed with his idea that “creativity is not simply a property of exceptional people but an “exceptional” property of “all people” and that fostering creativity is an integral part of the teaching and learning process. During the 4-day time period I attended several affiliate functions such as the affiliate luncheon where I met the past TESOL President Mary Lou McCloskey and listened to Denise E. Murray from Macquarie University, Australia speak about the importance of leadership qualities within TESOL. For her the “challenge is to learn to respond to whatever there is time for and to acknowledge people for what they do.” Later we broke up into committees and in my group, led by Suchada Nimmannit, TESOL Board Member from Thailand, we discussed why and how to obtain funding for professional development activities and issues such as how to increase membership in the local branches and how to foster communication links between the affiliates. We agreed for instance that Affiliates could share articles for their newsletters. I attended other affiliate events and was especially interested in a presentation by Joyce Kling from the Copenhagen Business School. Joyce King, who was a speaker at the TESOL Colloquium in Paris last November (2006), dealt with EFL teaching for “non-native” students in Denmark and the actions being taken to remedy their poor performances. Finally, due to my special Interest in films and video-podcasting I attended the group meeting on Video and Media (VIDMIS) led by Donna Tatsuki, President of TESOL Japan. We elected a new president for our group, David Smith. As for the presentations and demonstrations there were about 15 going on at the same time. Some rooms were so full that we had to sit on the floor. For one in particular we had to wait in line for 20 minutes. 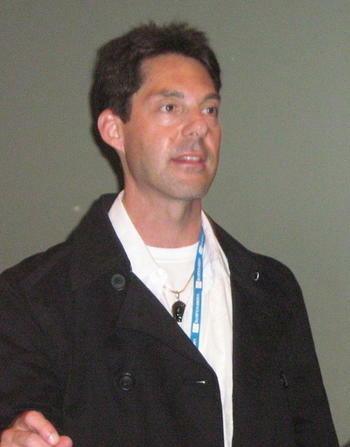 It was a talk by Dave Sperling, the man who created Dave’s ESL Café. He is an amazing individual, both modest and humorous and ever so dynamic. He explained how he got started on his Internet adventure and what lies ahead especially in the realm of video podcasting. His advice to us all: “Trust your students. They will figure out the technical side of new technology themselves and help their teachers!” Dave Sperling’s speech was inspirational and well worth the wait. 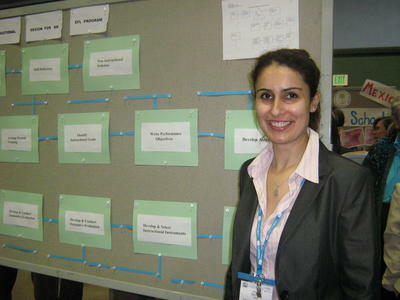 Among the younger speakers was a young woman of Turkish origin, Semire Dikli, who presented the findings of her Ph.D. thesis. She had been studying the possibility of using software evaluation systems to grade “essay” writing. TOEFL and TOEIC and other firms offering international exams are interested in using computer evaluation in the future, yet there are many obstacles to be overcome. Another young speaker who caught my attention was Belinda Braunstein. She gave a very interesting and dynamic poster presentation on student video films describing the different steps in this activity. Her colleague Karen Taylor described her work as instructional technical coordinator explaining how she would meet with the teachers of a school or department to assess the available technical equipment and then find ways of maximizing on that potential. She said her role was primarily to help teachers overcome fear or even loathing as regards high technology. I also visited the exhibitors’ hall where publishers offered free samples of most of their production. Many attendees regretted not having come with next to no luggage and an empty suitcase! I also attended a meeting of the Institute for Language and Education Policy, a nonprofit organization led by James Crawford, dedicated to promoting research-based policies for educating English and heritage-language learners (http://www.elladvocates.org/). These people are lobbyists intent on bringing in a new reformed version of the “No Child Left Behind” bill that would be based on the work of “real” educators who know what the “real” needs of children are as opposed to the politicians now in office, who only know how to legislate. There was one presentation that I really regretted not having gone to, but it was scheduled just before my own when I was busy preparing my equipment. A young teacher from Peru told me afterwards that it was by itself worth the expense of her trip to Seattle. It was on Moodle, a free Open Source software package, with a demonstration of how this course management system (CMS) designed for teachers using sound pedagogical principles operates. For more information go to: http//:www.moodle.org/. One of the great advantages of such a convention is the possibility to network. Although most participants came from the USA and teach ESL in an environment where the language being taught is found everywhere, it was surprising to observe that the issues facing ESL teachers are similar all over the world. Unfortunately, we are a profession where most people are underpaid, work on many part time jobs, get little self-development, have to deal with much bureaucracy, feel marginalized and are rarely acknowledged properly for their contributions to the institutions where they work. Often we are under enormous pressure to produce tangible results such as fluency within one year with only 2 hours a week. Dorothy Zemach “Essential Teacher” Columnist writes “ESL is the most exploited profession by the hiring of many, many part-timers in lieu of full-time positions. This is a slap in the face for those who believe that the teaching of ESOL is a profession.” In France this is particularly true of the “vacataires” that make up 60% of ESL teachers at the university level. The four days went by very quickly so I didn’t have much time for anything other than the convention. One morning, though, I visited the famous Farmers’ Market on Pike Street where the merchants throw fish to each other, but I didn’t have time to go up the Space Needle and see the revolving restaurant nor visit the underground city starting on Pioneer Square. I saw the Boeing complex from afar, but I never got as far as the Microsoft. Headquarters. (Anyway I am a 100% Macintosh fan!) So there is plenty left for another visit to Seattle! On Friday evening I ate dinner at a beautiful restaurant called “Railspur” with a view of the sunset over the Pacific Ocean. That was with other attendees to celebrate after my own presentation on “Student Films as a Memorable Linguistic Experience”. 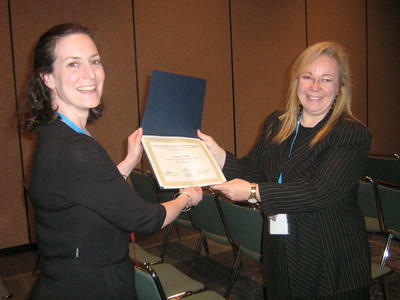 So how in a nutshell do I evaluate the “TESOL Convention” experience? It was unbelievably dense and exhilarating with the opportunity to network with devoted teachers from all around the globe. It was a long way to go and an expensive trip, but for me it was a one-time event I feel many teachers should be able to participate in. Ideally, a different person should be selected to attend each year and TESOL France should obtain a grant to cover that person’s expenses. Misty Adoniou, President TESOL Australia suggested Affiliates obtain grants by offering to provide reports for example on TESOL convention presentations dealing with how US universities recruit foreign students. “La Conference des Grandes Ecoles” might be willing to finance such a report. 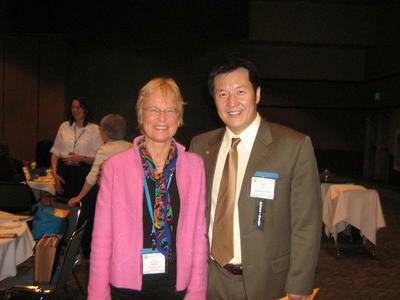 As regards the years to come the TESOL President Elect 2007-2008 Shelley Diane Wong spoke of plans for the future. The annual convention may soon take place outside the North American continent, but in that case it will probably be somewhere in Asia and not in Europe. TESOL is currently developing a resource center, which opened on the website in February, and is asking members for contributions. So in conclusion let me say that the Seattle Convention made me feel proud to belong to a profession where we work long hours and sometimes in difficult conditions to allow young people to learn how to communicate in an international language. Each one of us is thus contributing towards making this world a more peaceful place to live in. At least that is what we are striving to do perhaps in our different ways but always towards this common goal of inter-cultural understanding. Marianne Raynaud, a former professor at INPG and recently retired, has just finished writing a digital resource book, which is now available online for any English teacher interested in her ESL materials. The latter can be printed onto A4 sheets and photocopied freely. Marianne Raynaud recently gave a presentation at the 41st annual TESOL convention in Seattle, WA on “Student Films as a Memorable Linguistic Experience”. Her PowerPoint on this topic as well as the films she showed can to be found on the DVD entitled "QualityTime-ESL.com", which constitutes her digital resource book. She has also produced a 50 minute film “Scenes from an ESL Classroom” that can also be purchased online.